Ok, here we go - this is why I signed up here so that I could pick the brains of so many experienced folks...I'm decking a 1436LT - plan is to put a livewell inside of the middle seat (replacing the foam), framing the decking with aluminum and topping everything using FRP backed by expanding urethane foam. In the end the deck will be coated in Tuff Coat rubberized marine coating. 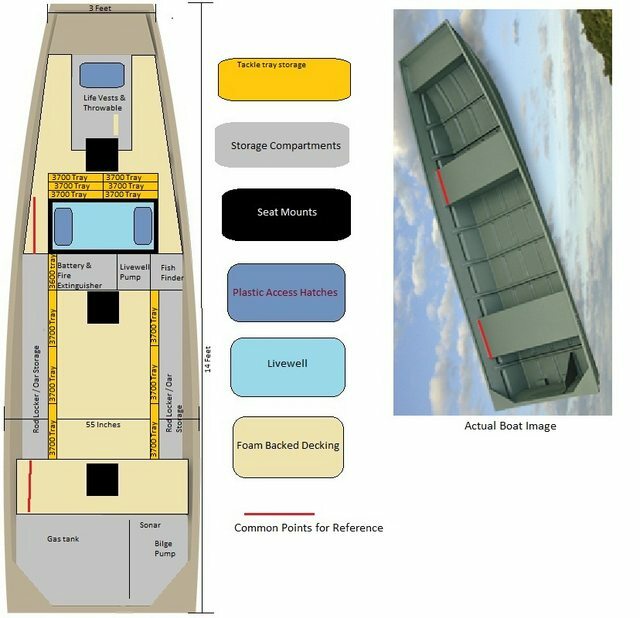 Finished product's decking layout will loosely resemble this - major differences being the side rod-lockers rather than shelves and the layout of the hatches / livewell & hardpoints for seats. 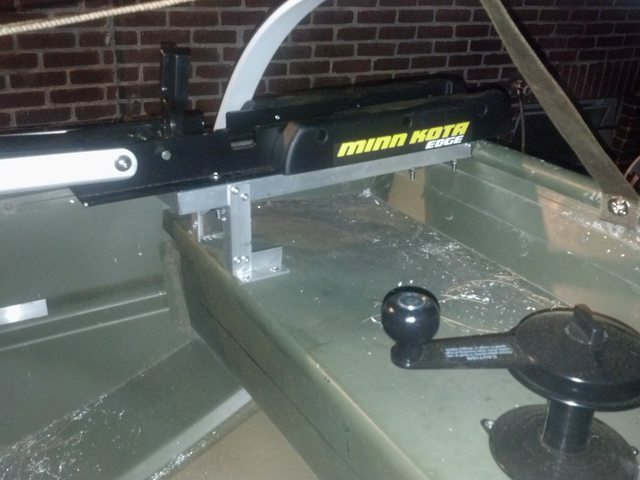 I will use a hole-saw to cut through the middle and rear bench seats and install PVC tubes extending up under the bow flooring and through the rear bench to allow for storage of 2, possibly 3 clearances permitting, 7' rods on each side of the boat. I live in a remote area, so being able to lock the rods in the boat and not have to lug everything up and down the bank would be nice. I apologize for not referencing this builder and giving them credit - I saved the image during my research and didn't save the source. Last edited by onthewater102 on 04 Jun 2014, 10:41, edited 2 times in total. Livewell and forward tray rack are complete - rack actually fits 8 (4x2) 3700 trays rather than 6 in my rough schematic. Pics will have to wait for a day when I'm working on it during daylight hours. Getting ready to frame the rear bench and hatch over the gas tank area...nervous b/c there's very little clearance above the fuel line fitting to the underside of the hatch - I'll have to line the underside with aluminum chimney flashing with a bead of caulk down the joists to ensure even if gasoline splashed it cannot get to the polystyrene board above. I'll be interested in seeing how your project goes. 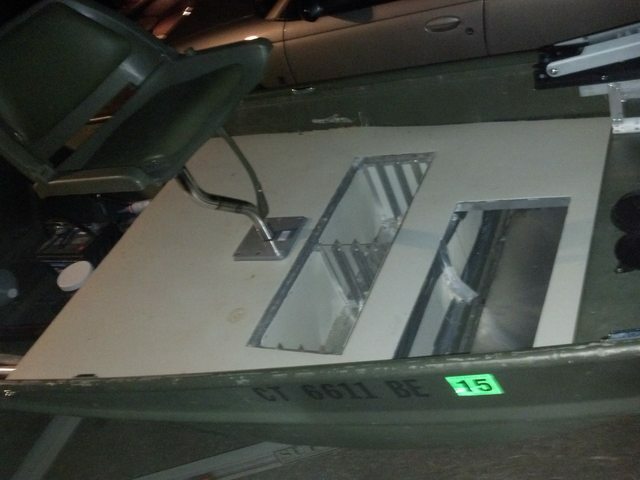 I have a platform built on the bottom of the upper section of my 14' between the middle seat and front "deck" and I am just so skeptical that it won't be extremely tippy when putting the deck that high above the water line. While I'm fortunate that there isn't access for motor boats on the waterway behind my house I still didn't want to push my luck with elevating the front deck. If it weren't for the fact that it will barely clear the fuel tank in the back and needs the ~1/2" foam backing for support I'd be level with the tops of the benches. Very lucky my father is an engineer - by his math this setup should save half the weight that I otherwise would have added using 1/8" aluminum angle and sheeting, with similar cost savings too. Picked up a 50' roll of 10" wide thin gauge aluminum flashing from the roofing department at Lowes - I'm going to lay this beneath the foam under the main deck to keep any splashed gasoline from floating around and getting under the foam. I riveted a piece of the aluminum sheeting (cut to be 29 1/8" x 8 7/8" with a pair of tin-snips) to make a rectangular base bordered by the two 29" sections of 1/2" angle and two of the 9" sections forming the outer border of the rectangle. The rectangle was bisected by the remaining two pieces of 9" long 1/2" angle set back to back denoting the separation of the left and right trays. This formed 2 smaller rectangular sections the equivalent of 4 3700 trays standing on end. Then I riveted the 9" sections of 3/4" angle on end standing up to act as dividers between the trays creating the slots for each tray to sit in. These will ultimately be hung riveted to the floor supports outlining the cutout for this storage compartment. Took a piece of general advice to heart, that being with any used outboard before you start it up, if you don't know the history - replace the impeller! Well, I did, and when I opened it up there was an EXTRA GASKET between the impeller housing and the face plate ( parts #28 & 33 on this diagram http://www.boats.net/parts/search/Mercu ... parts.html ) - mind you I'm not talking about the large O-ring seal for the housing - no - an entire sheet gasket which invariably was all chewed up and clogging up the outlet port from the water pump housing leading up to the motor. Add insult to injury - only one of the impeller washers was even there - and it was on the OUTSIDE of the impeller housing!!!!! On top of it all the bushings which align the impeller cover to the base plate were missing, and the housing looked as though it'd been hit with a hammer. Somewhere, sadly, there is a person who put this together presumably thinking (and I use the term EXTREMELY lightly) they'd done this correctly... Considering there was a diagram with the correct order to assemble these parts along side the parts list...yike...some people are so dumb it's amazing their brains can keep their hearts beating. Be ware - this mystery person has the right to VOTE!!! Been a while since I updated - progress is SLOW - too my reality in my life. 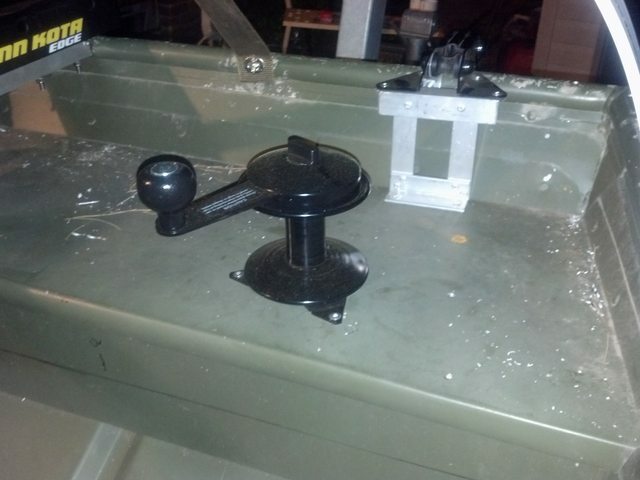 I flip-flopped the position of the tackle trays and the seat mount to give the seat mount a sturdier mounting position. I will be adding a second 45deg support to each side of the seat mount abutting the rib so the rivets won't be carrying load in shear. 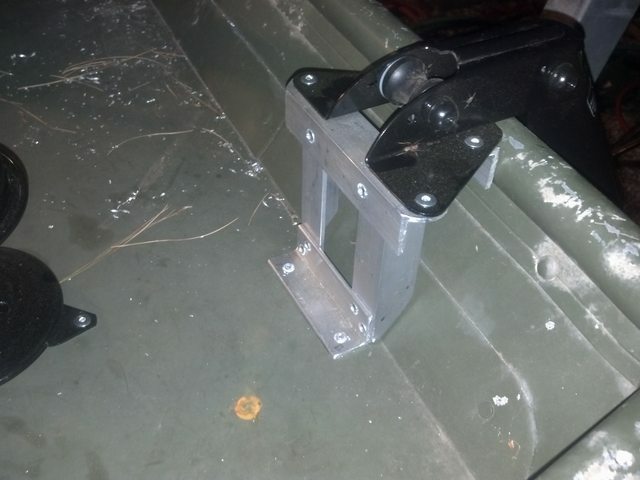 I will need similar supports for the sides of the tackle rack - then 4 vertical supports on the front cross-member. So much time spent cutting and grinding. The trickiest part to this project is figuring the order you need to attach the various pieces so that you have room to drill and get the rivet gun in there - I think I've drilled out 25% or more of the rivets I've installed. 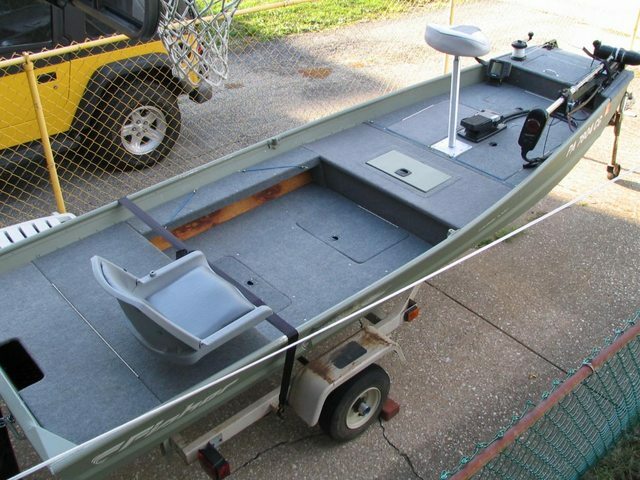 Hopefully the front decking will be done soon - need to run conduit through the sides and get the wiring for the trolling motor and fish finder set...the front is by far the most intricate part to the project - the rear deck will be much simpler - as will the rod lockers - OH which reminds me - I need to get pics but I found oars which have an aluminum tube with a plastic insert blade - I was able to make the plastic blades removable so they are retained by a hitch pin, but they come apart for easy below deck storage. I was pretty happy knowing I'll always have an emergency propulsion option available (I don't trust 2 strokes). Last edited by onthewater102 on 14 May 2014, 23:18, edited 1 time in total. After the expanding foam set-up I realized I'd gone way too far with the aluminum angle up front - two trusses capping off the manufacturer's ribs level to the middle bench seat would have been fine. The FRP backed by 2# expanding marine urethane foam is like concrete - no flex what-so-ever. And it's super light. 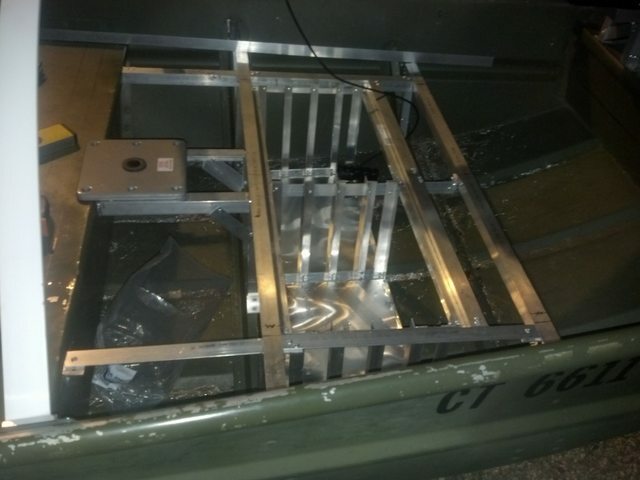 Had I just run the 2 trusses (as it's all I really needed) the aluminum would be the same as what I'd needed to use a conventional 1/2" plywood deck, but the plywood would have weighed 25lbs whereas the foam/FRP combination weighs 17lbs and stiffens the entire front of the boat. Cost works out to be about the same. I should have just set a pair of Plano 974 tray organizers flush with the deck surface rather than fabricate the tray slots myself. I anchored the seat mount to the framing by first installing U-Nuts to the aluminum angle or into the rear bench(I've seen them called Fender Nuts, J-Nuts or Speed nuts online) which allows me to unscrew the seat plates if I ever needed to. I foamed the deck in separate stages - first blocking off the front cavity to be a storage bay with some FRP scraps sealed together with tape. I ran a hose down the center channel so the front can drain, and blocked the side channels with pieces of aluminum flashing tapped on so I can still run wires through there as needed. I foamed between the trays and the front compartment with a piece of scrap FRP capping the compartment (held down by hand pressure) so the excess foam would spill out to the sides of the trays - then I foamed the sides capping them to spill back into the area around the seat base. Lastly I glued down the FRP deck and filled the cavity below the seat mount with foam through a hole cut in the FRP which will be covered by the seat mount. All that's left to finish the front now is to primer & paint on the Tuff Coat rubberized top. This will give me traction and prevent the FRP from being exposed to any UV light. 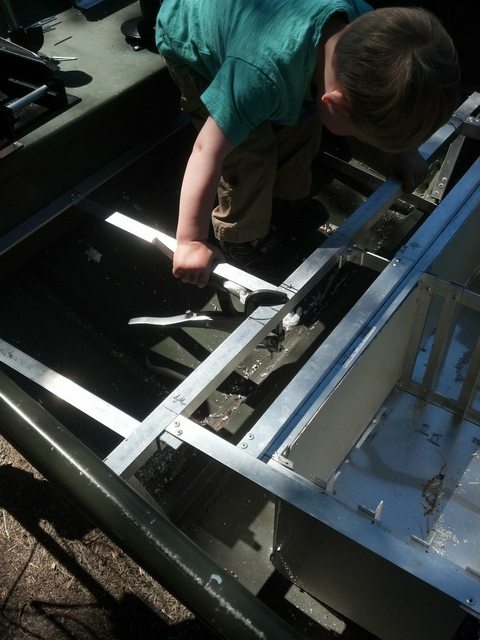 Now for a bit of fiberglass touch-up, install the tempress hatch for the front compartment, fabricate a hatch for the tackle tray and a shot of Tuff Coat and I'll be done with phase 1 - Phase 2 is the mid-deck, oar compartments and livewell. Last edited by onthewater102 on 05 Jun 2014, 08:45, edited 1 time in total. That is looking real good! 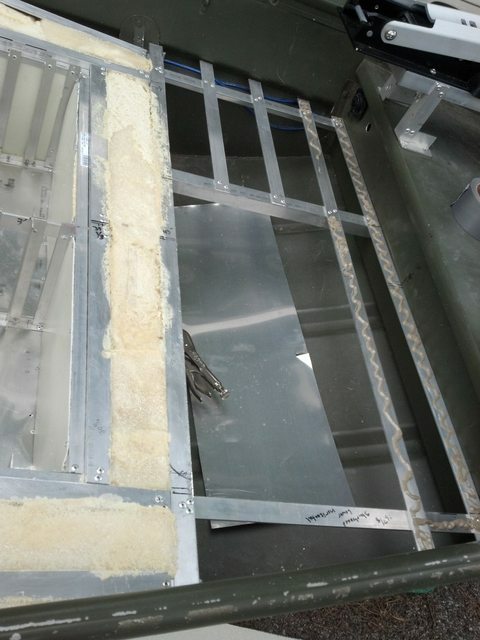 What foam insulation are you using? 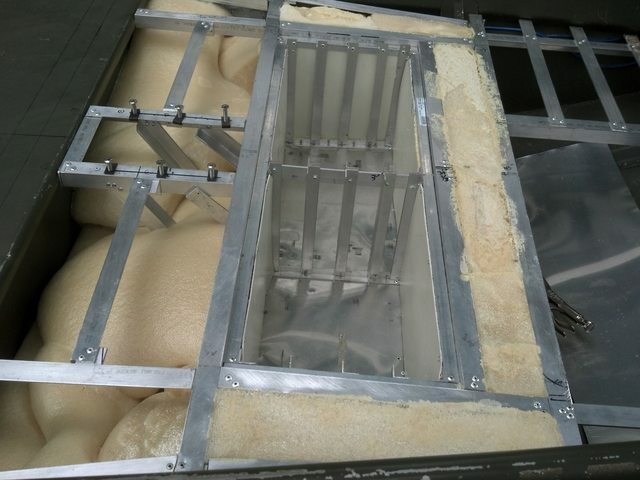 2lb expanding closed cell urethane from http://www.uscomposites.com/foam.html - Oh, and I ran a piece of 1/2 hose through the channels stamped in the floor from the rear compartment to the front so the front cavity can drain. You can see in one of the pics I've got a pair of vice-grips keeping the hose from getting pulled rearward. Despite my efforts to block the foam from filling the channels it did spill through and fill them in. 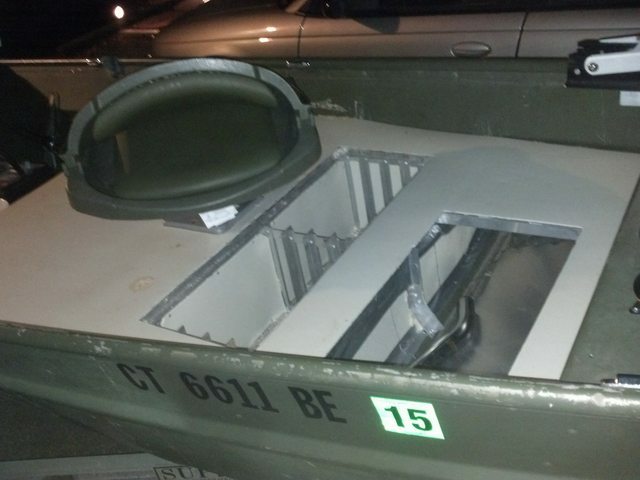 Had I not added this I would've been in big trouble the first time I took water over the bow. excellent so far. Nice & stable - I'll get a video up when I can of me taking it out on the water. PM sent with more info on the hatch & framing.